Saturday, April 6 saw a "fabulous" opening reception for the annual exhibition of artwork by students of the Cooper Union Saturday Program. Open to the public, the exhibition, continuing until April 12, showcases works by artistically inclined New York City public high school students who receive free classes to supplement the ever-dwindling public school arts funding. 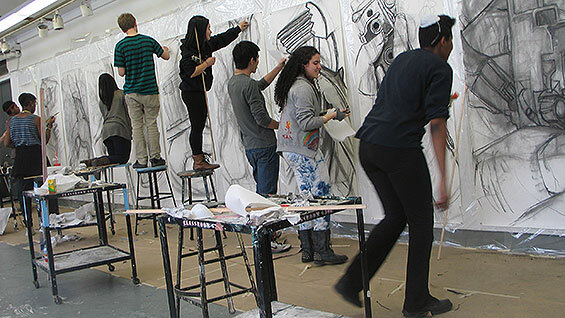 The works of over two hundred students run the gamut of media including drawing, painting, collage, sculpture, graphic design, architecture, sound composition and even a spoken word component. For the first time the show acted as a fund-raiser for the program in an attempt to offset budget cuts. "It was fabulous. The exhibition celebrates the culmination of two semesters-worth of art work by New York City public high school students", Marina Gutierrez (A'81), Director of the Saturday Program, says. She described the opening as a happy "mob scene" where, "kids who may not otherwise have received a lot of encouragement in creative fields have a moment of affirmation and pride. They run around with friends and family pointing out their work. You see people from communities that are not normally art-focused." Wall texts identifying the artists add a prized note of validation. Works are hung salon style, organized by each studio class. The architecture class, for example, will include model shelters constructed from debris left by Hurricane Sandy. The senior portfolio class will display large-scale charcoal drawings. 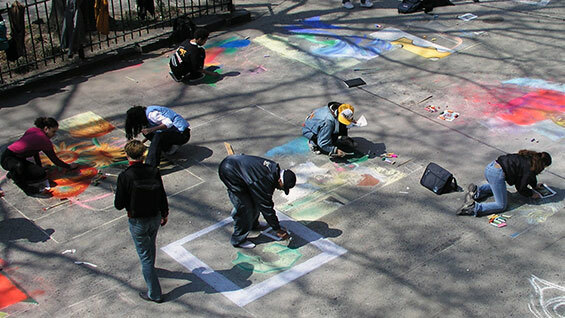 Weather permitting, visitors on the opening day will also be treated to current students of the program reproducing works of the Old Masters in chalk on the sidewalk in front of the Foundation Building. Additionally, midway through the opening, visitors will be led to the Rose Auditorium where spoken word performances will take place. 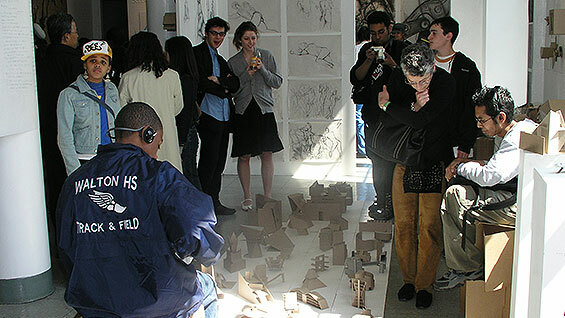 Undergraduates of the School of Art and School of Architecture established the Saturday Program in 1968 because, "they felt that art was underfunded in New York City schools," Victoria Febrer (A'08), a former student of the program turned Cooper Union graduate turned instructor and Administrative Coordinator at the Saturday Program, says. 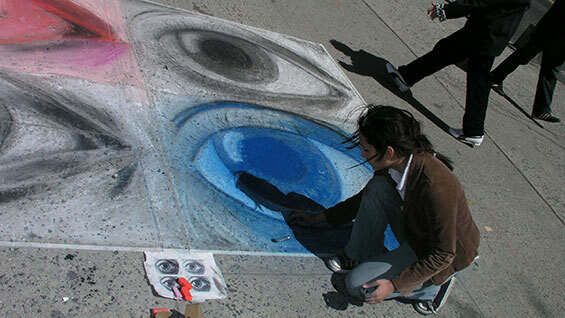 It continues to be taught by teams of undergraduates under the tutelage of professional artists. Named after its weekly Saturday 10 - 5 schedule, the Saturday Program has become an institution within an institution, reflecting The Cooper Union's core mission of providing "public programs for the civic, cultural and practicable enrichment of New York City." Besides free class time all art supplies are provided gratis. The program has expanded to including sound design, occasional video projects and even a significant writing component. Approximate 90% of Saturday Program graduates go on to higher education, according to Ms. Gutierrez. But budget cuts throughout Cooper Union have meant lean times for the Saturday Program, which launched its first ever fundraiser this year. For example two instructors that teach writing skills could not be paid for the second semester. "We told them we would have to let them go and they said, 'we have a job to do and we will do it just the same' " Ms. Gutierrez says, "They volunteered their time, which is heartwarming but not sustainable." The fundraiser will pay for teacher's salaries, model fees and even light bulbs for clamp lights in the drawing class, among other things, Ms. Gutierrez says. For the first time the show itself worked as a fundraiser, including the passing of a hat, "church style," according Ms. Gutierrez, that netted over $1000. "It was noticable how the spirit of the show was raised to a new level when people felt more ownership by donating," she said. Donations have been coming in, often from grateful former students or their parents. Ms. Gutierrez recalled one mother of a former student who came into her office, crying. "I thought something terrible must have happened so I had her sit down," she recalls. "The woman, for whom English was not her native language, said to me, 'All these years we sent our son to your classes and we just assumed the money came from somewhere else.' So she reached into her purse and pulled out a $100 bill." The Saturday Program continues to reach out for donations in an effort to attain their goal of $15,000. "I really learned something in terms of how actively people want to be a part of the program by donating," Ms. Gutierrez says. "And these are people who don't have a ton of money."